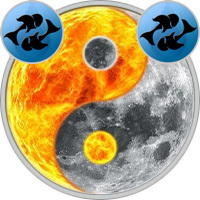 The combination of your Pisces Sun and Pisces Moon signs produces a dualistic personality and one that is quite difficult for the world to easily understand. You are highly introspective, almost to the extent that the outer world around you seems odd and full of what you perceive as weird notions. A tendency to withdraw, makes you strangely inaccessible at times. Yet you have a very warm and likable quality when you allow yourself to open up to others and let these traits show. You have an enormous faith in your intuition and your self-sufficiency, but at the same time, you value close relationships and social activity. For the most part the double Pisces is amenable, acutely interested in others, and a trustworthy friend. In handling your work, you are by nature very painstaking and accurate in detail. You are loyal to your duties and fulfilling obligations. Mentally you are quick, perceptive, intuitive, with an almost mystic belief in your hunches. Insight and creativity is your great strength. You have an uncanny way of seeing the core and substance of things, making you both motivational and a universal-thinker. Artisitic performance is often your forte. Things that others cannot understand, natives of your combination have an intuitive understanding of; they experience their environment on a level that is very delicate, almost awe-inspiring. With their marked spiritual gifts and empathy, they cannot handle seeing suffering. You are mysterious and carry this with you. You are not totally from this planet and are a tremendously sensitive and vulnerable soul. You are almost free of cunning, malice, or deceit. You are innocent, unquestioning, and conscientious and all of this makes you very vulnerable. You are saved by intuition, and it is almost your only defense. Without it, your innocence would leave you open to too much adversity. Practically as though guided by a guardian angel, you always seem to know just when to charge and when to withdraw, who to trust and who to avoid. Other worlds concern you more than this one. Because your imagination is intense Pisces-Pisces finds it hard to differentiate between fantasy and reality at times. You are a very self-examining person, with a lot of sympathy. If people thought you were self-centered and worldly when you were young, it was because you were so fearful of not having the comfort and security; you grabbed all the material possessions you could gather. In fact, you will always have everything you need to get along in life because your allure and refinement assure that. You find it difficult to concentrate. Your mind tends to drift off in daydreams and fantasies because you are so sensitive and emotionally open to your environment that you need to remove yourself at times. All of a sudden, while working on a meaningful project, or in the middle of a serious discussion, your eyes will fade out of focus and you will be right in the middle of some captivating trance and out of contact. You must have some technical training and you must find some discipline if your artistic potential is ever to be realized. The male may be drawn to a job that offers permanence while the female Pisces-Pisces is frequently interested in the security and shelter of an early marriage. They must both fight the urge to withdraw from society and this is important for both the male and female double Pisces. You may find it hard to adjust to the business of the contemporary world because you are shy and vulnerable. But you always have your intuition to guide you. Creative and artistic talents are usually obvious even though strong ambition and drive are not visible in the double Pisces. Your mind is highly visual and powerful. Michelangelo, an artist known to the world, was a double Pisces.